Magic Prague, city of Art Nouveau and Deco, the Baroque and the Enlightenment. Yet also a place of gothic enchantment, golems, phantoms, alchemists and astrologers – the fantastic and fantastical. There is nowhere quite like the capital of Bohemia, with its rich mix of symbolism and style. The Tarot of Prague brings the the diverse beauty and symbolism of the “Magic City” to a fully-illustrated 78-card tarot deck. The cards are made up of intricate images collaged from thousands of original photographs of the fabulous art and architecture of Prague. The deck, published in 2003, was voted “Deck of the Year” at one of the largest international tarot forums, and proved hugely popular with lovers of tarot, magic and, of course, Prague itself. The second (unlimited) edition went into two printings. 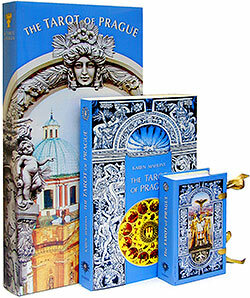 The Tarot of Prague will be issued in a new, revised Limited Edition in April 2016. Please follow us on our Facebook pages for more information.